Following Acrobat’s successful re-issue of the first two Jonathan & Darlene Edwards LPs “The Piano Artistry of Jonathan Edwards” and “Jonathan & Darlene Edwards In Paris” (“The Complete Original Albums” ACMCD4356), we are delighted to bring you their next recording adventure “Sing Along With Jonathan & Darlene Edwards”, originally released in 1962. It features, of course, the great Jo Stafford and her pianist/musical director husband Paul Weston, “performing” another selection of brilliantly off-key classics – a technique which had won them a Grammy for Best Comedy LP for the “In Paris” LP. 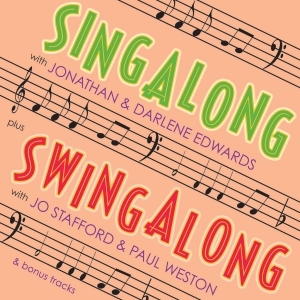 Along with that, we have included a selection of “straight”, but equally entertaining, performances recorded by Jo with Paul as MD during the 1950s, admirably showcasing her inimitable vocal styling and his fine arrangements, and brought together under the heading of “Swingalong with Jo Stafford & Paul Weston”. It’s a great value collection that demonstrates both sides of the couple’s extraordinary talent.